Spanning each afternoon before the fireworks, you’ll want to come down early to soak in some of BC’s best musical talent. Located at Second Beach in Stanley Park, this free all ages area will feature live music, food trucks, sponsor activations, a site-wide liquor license and the RE/MAX Family Zone. Bring your friends and family, kick back and relax in the sun while you enjoy the music! Programmed by our radio partner Z 95.3 FM, Z FEST will feature some of today’s top talent performing on the Bathhouse Roof at English Bay on each night of the fireworks. 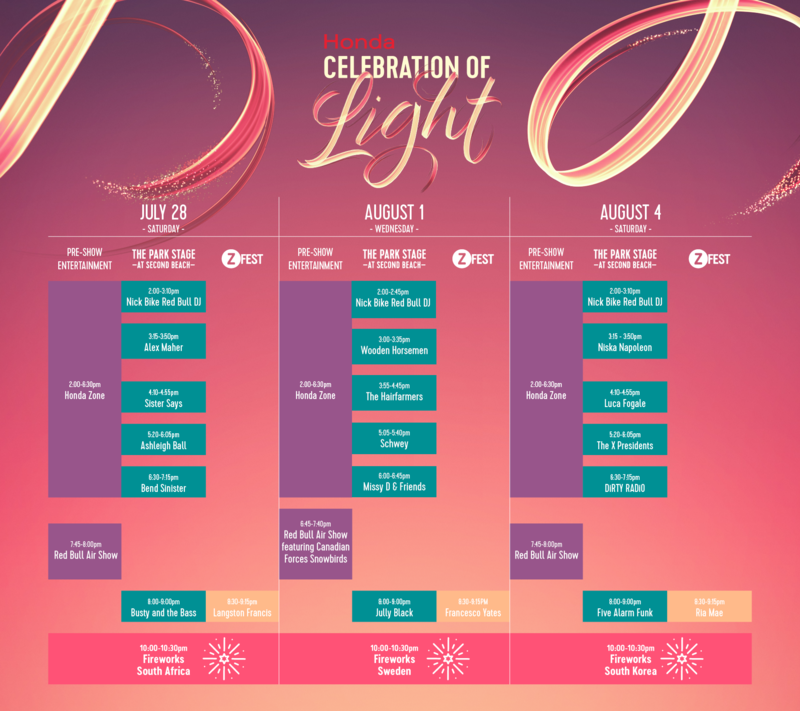 Tune into the fireworks music soundtrack from wherever you are by downloading the Honda Celebration of Light official Mobile App or tuning in to LG 104.3FM! The simulcast will begin at 10PM each night of the festival.